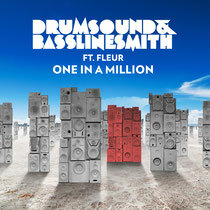 Following the summer 2012 track ‘Through The Night’, Drumsound & Bassline Smith are back next month with their new single ‘One In A Million’, featuring the sensuous vocals of Fleur. 2012 highlighted with two UK top 40 singles in ‘What Can You Do For Me’, a collaboration with Utah Saints, and their own Radio 1 A-list track, ‘Through The Night’. Hot new 22-year-old talent, Fleur, is fresh off vocal duties on DJ Fresh’s recent Nextlevelism tour, where she was introduced to DJ Fresh’s main support act, Drumsound & Bassline Smith and with such common musical tastes, it was a good match for the collaboration on ‘One In A Million’. The track is preceded by the free download only track ‘Back To The Future’, which is gaining support across the board from DJs such as Annie Mac, Mistajam and Annie Nightingale. Remixes come from Tantrum Desire, Wideboys, Northern Lights, Tony Anthem & Axel Ender, Reset Safari, Dubba Jonny and Northie. Tantrum Desire deliver a more slamming D&B mix with dark basslines whilst Wideboys go for a big room, bassline house makeover. Reset Safari take the track back to ’97 with deeper garage influences. Northern Lights serve up a bass-laden dubstep remix, Tony Anthem & Axl Ender go for a tough drumstep perspective and Dubba Jonny rounds the package off with a an epic trap vibe. It’s out April 22.